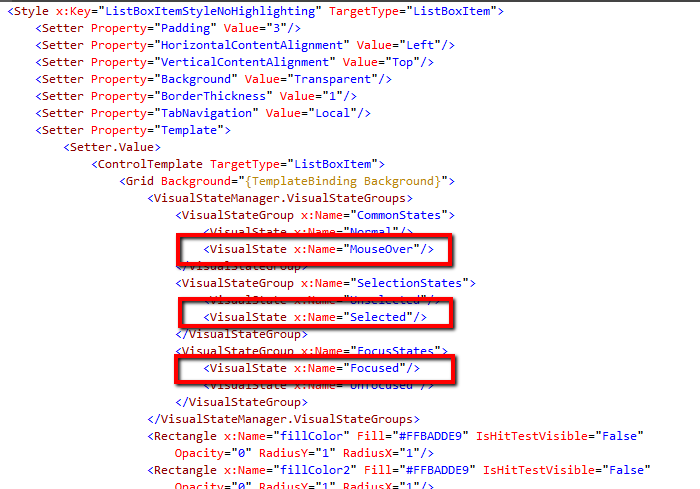 A Silverlight/Wpf ListBoxItem is highlighted when selected or when the mouse hovers over it. I need to display a list of items that are not highlighted when selected. This is a common scenario when displaying an inactive list for simply listing out some information. ListBoxItem’s default template can be easily inspected and modified using Expression Blend – Select a ListBoxItem in Objects and Timeline pane, Right click and select Edit template > Edit a Copy. Name you template and save it at the scope of your choice. I googled for hours and came across all kinds of solutions that just didn’t work.